The 2010 Olympics in Vancouver are well underway and so are the Ravelympics. I thought I would take a teeny tiny break from the non-stop knitting (and toddler chasing!) and take a quick moment to pop in and say hello and to give an update on my knitting progress. As I've mentioned in the last post I'm knitting up my first pair of socks. I chose to do something somewhat basic and easy. So I chose to do the Eclipse Socks that I've had in my Ravelry queue practically since the pattern was published. Since this is my first time venturing into the world of sock knitting, I decided to not deviate away from the pattern instructions at all, even when it comes to the recommended yarn. 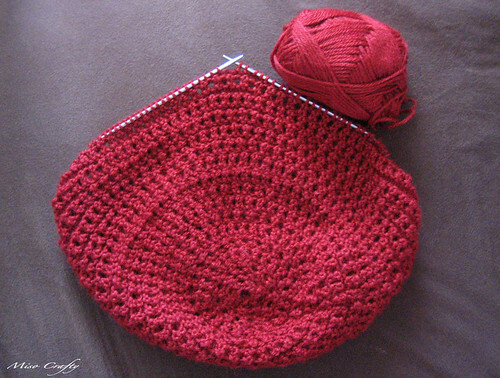 I'm using Knit Picks Stroll for both colors and so far it's going well. 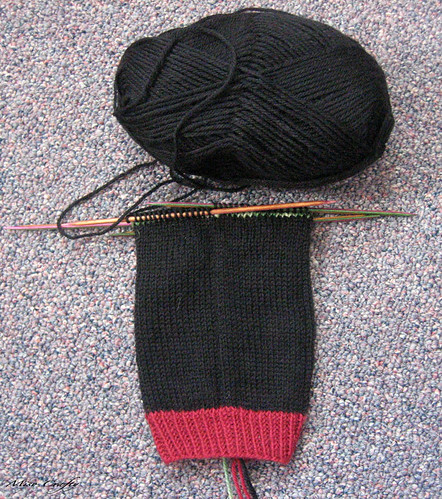 I had a little confused moment about the afterthought heel and needed to Google what the sock should look like before the heel is added. My second project is the Ribbed Lace Bolero, another 'been-queued-in-my-Ravelry-for-practically-forever' item. 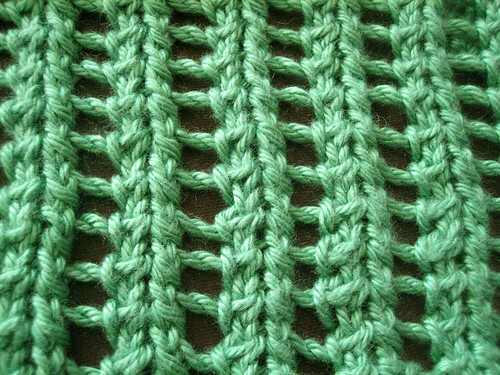 The pattern is über easy and quite TV watching friendly, granted that you don't drop a yarn over stitch on the purl side...which I did at the beginning of the lace pattern and took me precious minutes to figure out and fix. I marked the messed up area and hope that by the time I'm finished that it won't be noticeable. But I got a lot of it knitted up during the opening ceremonies. I've been quite the knitting machine all week that I managed to get this project completed a few days ago! My third project is the Eyelet Cap from the Fall 2009 Vogue Knitting issue. The second I laid eyes on it I knew I had to knit it. I honestly didn't think I would get to it any time soon since I had oodles of other patterns at the top of my list, but I've been needing another bad hair day/haven't had time to wash my hair day hat. And bad. So this project moved right up to the top of that list. It was a very slow going start but once I got some girth to the knitting and was able to move from DPNs to a circular needle the knitting went along fairly easy and fast. I'm now onto the 8 inches of ribbing...my most dreaded and boring part! My fourth and final project of the Ravelympics is actually a weaving one (pictured at the very top of this post). 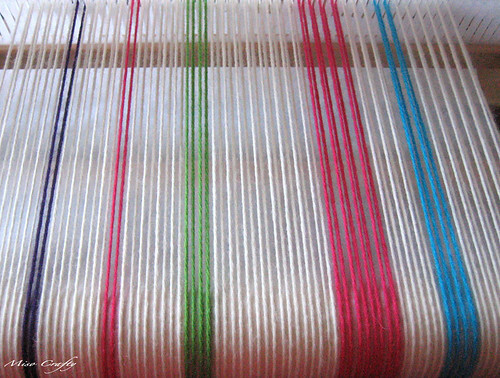 I warped up the loom a few days ago but probably won't get down to weaving until a day or so before the Olympics ends, since it'll probably take me an hour or two to weave and finish up. So I'm not too concerned with the weaving and figure I should concentrate on the more time consuming projects instead, which is the knitting. I got a fair bit of knitting done during my knitting group meet up earlier this evening, which makes me a very happy knitter. Since Brett has already put the Munchkin down for the night and is making dinner as I type, I'm going to take this opportunity to knit as much as I can before it's time to eat. I'll try to pop by again and give another update, but I can't make any promises, as I think I'm giving myself more credit than I deserve in the speed of my knitting. I was hoping to enter the Aerial Unwind event, but with all the hockey games being televised, my knitting is almost non-existent during those times. I guess we'll see what happens...GO CANADA!!! 'Til next time, happy knitting peeps! You have been super - busy, I'm especially loving the green yarn.